"I’m stronger in my legs, more alert, more focused and more relaxed"
One of the ‘internal’ martial arts of China, Tai Chi Chuan (the full name of the art) promotes health and well-being at the same time as being a potent form of self-defence. One of the enigmas of the art is that it can be practised on many levels, from a simple meditative exercise for health, to a realistic martial art. Tai Chi Chuan has a profound effect on the overall health, posture and vitality of the practitioner. 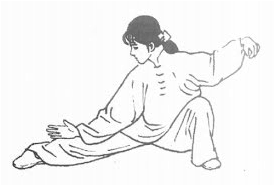 Tai Chi Chuan conditions the body and calms the mind; energy levels and mobility increase and the internal organs are massaged, enhancing their function. The NHS guide to the health benefits of Tai Chi. We teacher the 'old Yang' style of Tai Chi, passed on from Yang Jian-Hou > Li Jin Ling > Ku Yu Chang > Yim Sheung Mo > Lam Kam Chuen > Raymond Rand > our teacher Graham. It contains influences from many famous teachers including Sun Lu Tang and Ku Yu Chang. It’s the medium-frame Yang style of Tai Chi, and very circular in it's movements. See the article here on lineage for more details.